The Open Budget Survey 2017 findings on the systems and practices that countries have in place to inform and engage citizens — or not — in decisions about how to raise and spend public resources, and on the institutions that are responsible for holding government to account, come at a critical juncture. Around the world, there has been a decline in public trust in government, in part due to instances of corruption but also because of dramatic increases in inequality. In a number of countries, leaders who have disguised their intolerant and reactionary agendas with populist rhetoric have been swept into power by those who’ve been left behind. These political shifts have driven out many government champions of transparency and accountability — especially those from countries in the global south. More broadly across countries, there has been shrinking of civic space, rollbacks of media freedoms, and a crackdown on those who seek to hold government to account, including individual activists, civil society organizations, and journalists. Because open and accountable public budgeting is at the center of democratic practice and equity, it is the first place we should look for ways to strengthen the interaction between governments and citizens. Ensuring that the budgeting process is characterized by high levels of transparency, appropriate checks and balances, and opportunities for public participation is key to stemming the decline in confidence in government and representative democracy. In the face of the spread of profound threats to active, informed public participation, and thus the ability of citizens to ensure their governments will pursue policies that improve their lives, the Open Budget Survey 2017 will provide essential data on the state of budget transparency and accountability around the world. To answer these questions the Open Budget Survey (OBS) assesses whether national governments produce and disseminate to the public key budget documents in a timely, comprehensive, and accessible manner. In addition, the 2017 survey includes a newly enhanced evaluation of whether governments are providing formal opportunities for citizens and their organizations to participate in budget decisions and oversight, as well as emerging models for public engagement from a number of country innovators. It also examines the role and effectiveness of legislatures and supreme audit institutions in the budget process. The OBS 2017 is the sixth round of the survey and covers 115 countries across six continents. The coverage of the survey expanded in the 2017 round to include 13 countries for the first time, including some advanced economies such as Japan and Australia, emerging economies such as Côte d’Ivoire and Paraguay, and fragile states such as Somalia and South Sudan. The survey, which is implemented by independent budget experts in each country and rigorously vetted, provides governments, civil society organizations, and development practitioners with key data and analysis to allow them to identify baselines and trends in country practices and implement or advocate for reforms to close gaps. In addition to providing the latest findings on open and accountable budgeting, the report for the 2017 survey will also provide suggestions for improving countries’ public finance systems and practices to better ensure more effective and responsive use of public resources to meet public needs. The Open Budget Survey 2017 could not come at a more critical juncture as we look to reinvigorate democratic practice, re-engage the disaffected, and restore public trust in public institutions. Be sure to see the results at www.openbudgetsurvey.org on 30 January 2018! 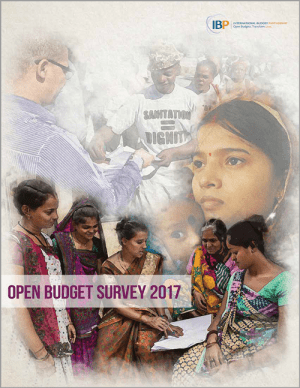 Be one of the first to know about the Open Budget Survey 2017 results! Click here to subscribe to email updates from the International Budget Partnership. As usual, this is an excellent article. I’m looking forward to the recent findings [especially with changed yardstick]. Hope some improvement in Afghanistan budget system! Afghanistan OBS score has been improved this year and stay tuned for the launch tomorrow, 11th Feb 2018. Budget transparency and accountability is a big problem/concern in most Nigerian states, like Rivers state. Funding is a big constrain for the kind of massive advocacy our NGO wishes to mount. Wish you success in this important programme proposed. When we are informed about that, allow us informing you it acts an excellent action being deserving to advance more and more deeply..